What do the four LED’s on the top right of the keyboard indicate? Caps Lock, Num Lock, Scroll Lock and Fn. When the Fn light is illuminated it means that the keyboard is in the secondary (“embedded”) layer and each key will produce secondary key actions legended in blue. My pivot tether, can I get a replacement? Yes, replacement Pivot Tethers can be purchased from the Kinesis Store. Can I change the hotkeys or create custom layouts on my Freestyle keyboard? No. The Freestyle keyboard is not programmable. 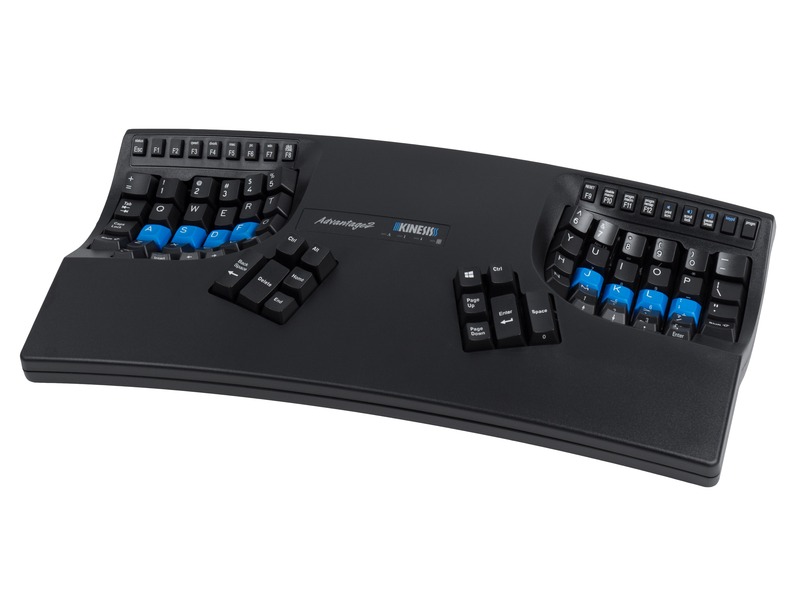 If you are looking for a programmable split keyboard, checkout the new Freestyle Pro. Will the Freestyle2 PC work on my Mac? Go to System Preferences/Keyboard/modifier keys (make sure the selected device is for the Freestyle keyboard (KB800PB)). Swap Ctrl with Command. Now the hot-keys will work as intended. This will also make the individual Ctrl keys behave as Command keys, which makes more sense on a Mac. Do I need to install any software or drivers? No. 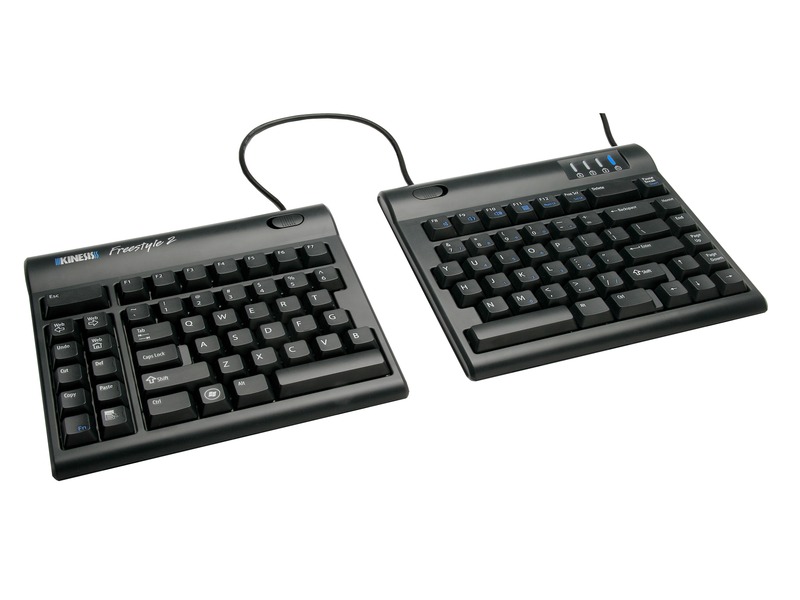 The Freestyle keyboard is recognized by the operating system as a standard USB device and thus loads the default keyboard driver on the operating system. 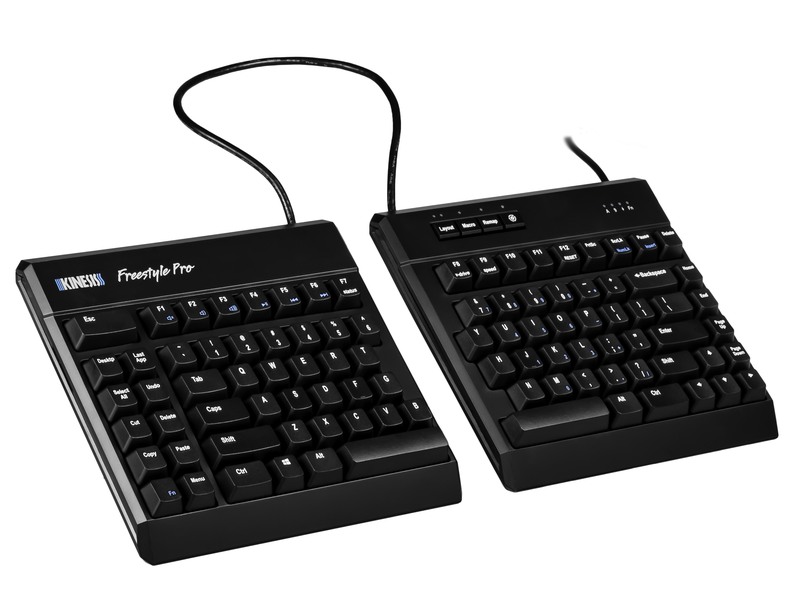 The Freestyle2 keyboard is plug & play. If your Freestyle2 is not working review the Troubleshooting Tips at rights. If you still need help, use the link at the bottom of the page to submit a Trouble Ticket. 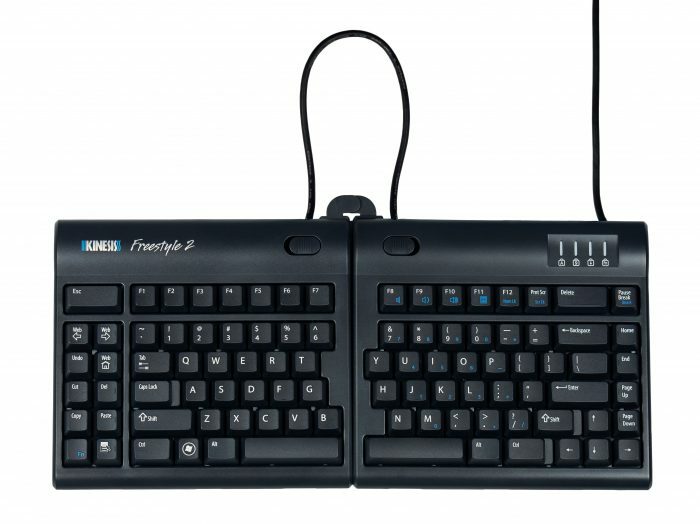 The Freestyle PC keyboard has an embedded numeric 10-key on the right side of the keyboard. When the keypad key is on, as well as Num Lock, the keys on the right side will produce numbers. Simply press and release the “Fn” key (bottom left of the keyboard) to toggle on and off. Check keyboard connections. Make sure the keyboard is connected directly to a USB port on the computer. For testing purposes, do not use a USB hub, docking station or KVM switch. Connect direct. Reboot computer. Press the Fn key and see if the LED light turns on or not. If the light turns on, it indicates power is received. If the LED is not turning on, that indicates a physical problem with the keyboard. You can also try connecting the keyboard to a different computer (preferably a different brand and/or model) and see if you can reproduce the problems or not.